Hideki Shirakawa (白川 英樹 Shirakawa Hideki, born in Tokyo on August 20, 1936) is a Japanese chemist and winner of the 2000 Nobel Prize in Chemistry for his discovery of conductive polymers together with physics professor Alan J. Heeger and chemistry professor Alan G. MacDiarmid at the University of Pennsylvania. While employed as an assistant at Tokyo Institute of Technology (Tokyo Tech) in Japan, he developed polyacetylene, which has a metallic appearance. This result interested Alan MacDiarmid when MacDiarmid visited TITech in 1975. In 1976, he was invited to work in the laboratory of Alan MacDiarmid as a post-doctoral fellow at the University of Pennsylvania. The two developed the electrical conductivity of polyacetylene along with American physicist Alan Heeger. In 1977 they discovered that doping with iodine vapor could enhance the conductivity of polyacetylene. The three scientists were awarded the Nobel Prize in Chemistry in 2000 in recognition of the discovery. With regard to the mechanism of electric conduction, it is strongly believed that nonlinear excitations in the form of solitons play a role. 1936 Born in Tokyo, in the family of a military doctor. Around third grade, he moved to Takayama, Gifu, which is the hometown of his mother. 1961 Graduated from Tokyo Institute of Technology (Tokyo Tech), Chemical engineering department in the School of Science and Engineering. 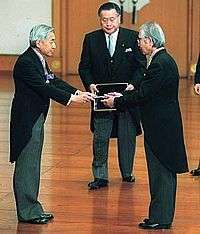 1966 Received doctorate from Chemical engineering department in Graduate School of Science and Engineering at Tokyo Tech. Obtained the post of assistant in Chemical Resources Laboratory at Tokyo Tech. 1976 Post-doctoral researcher in the University of Pennsylvania, USA with invitation by Alan MacDiarmid. One of his relatives, Hitomi Yoshizawa, is a member of the singing group Morning Musume Morning Girls. He is also related to Naoko Takahashi, the women's marathon gold medalist of the 2000 Summer Olympics. ↑ Shirakawa, Hideki; Louis, Edwin J.; MacDiarmid, Alan G.; Chiang, Chwan K.; Heeger, Alan J. (1977). "Synthesis of electrically conducting organic polymers: Halogen derivatives of polyacetylene, (CH) x". Journal of the Chemical Society, Chemical Communications (16): 578. doi:10.1039/C39770000578. 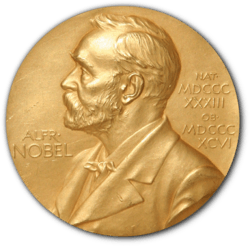 ↑ "The Nobel Prize in Chemistry 2000: Alan Heeger, Alan G. MacDiarmid, Hideki Shirakawa". Biographical snapshots: Hideki Shirakawa, Journal of Chemical Education web site. Shirakawa, Hideki (2001). "The discovery of polyacetylene film". Synthetic Metals. 125: 3–10. doi:10.1016/S0379-6779(01)00507-0. Shirakawa, H. (2001). "Nobel Lecture: The discovery of polyacetylene film-the dawning of an era of conducting polymers" (PDF). Reviews of Modern Physics. 73 (3): 713–718. Bibcode:2001RvMP...73..713S. doi:10.1103/RevModPhys.73.713.